KBS News is the most beloved and watched in Korea. <News 9> recorded an average 17.9% in veiwer ratings on weekdays for the Seoul Metropolitan area according to Nielson Company Korea. KBS also ranked 1st place in public opinion influence according to the Ministry of Culture Sports and Tourism. KBS news declared 2015 as the first year of its digital-first news strategy. The KBS Digital Newsroom created under Integrated News Room has helped to digitalize the entire news production process. 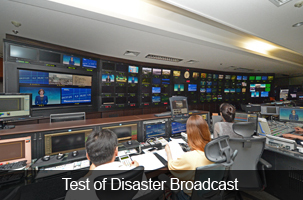 As the nation’s primary disaster broadcaster, KBS provides fast and accurate information to the public in times of emergency. KBS’ Disaster Reporting Rules were fully revised while a white paper on the news and coverage of the MERS outbreak was released.